Studio cottage w/1 queen bed and 1 full bathroom, quiet and relaxing. This charming and large studio cottage is perfect for guests looking for convenience to downtown with all the amenities of home. Comfortable and cozy, this home has a small fenced yard as well as a washer and dryer. Air conditioned and wireless internet. 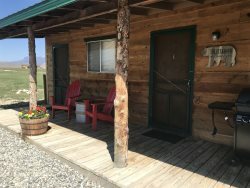 Make this beautiful cottage your home away from home during your stay in Cody! - A $39 damage insurance plan provides $3,000 in damage protection during your stay. You may decline this charge, but may be assessed a minimum $250 refundable deposit.